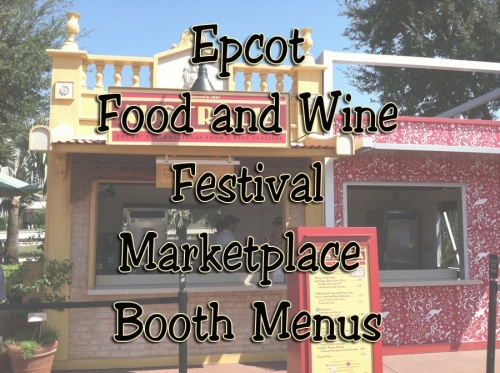 As the weather warms and the hours of light stretch, what could be better than going to a Disney Park? Unfortunately, as the temperatures climb and we walk more, blisters become an issue. 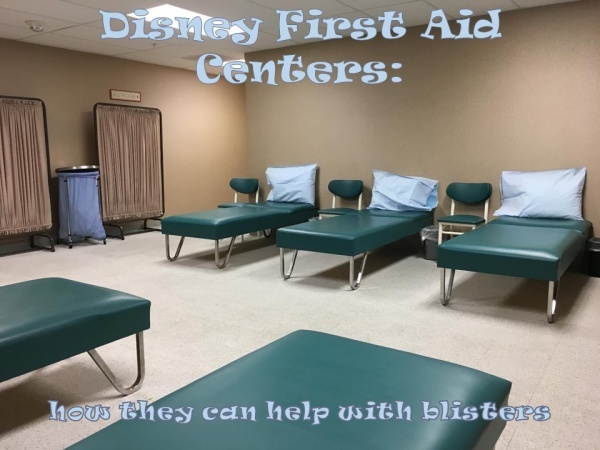 Blisters are a common injury in the Disney Parks and my family seems to visit Disney first aid for blisters more than I would like. Below is the cumulative knowledge that the Disney Cast Members have passed on to my family. May your feet never suffer. A fluid filled pouch that forms in the layers of skin between ‘old skin’ and ‘new skin’ is a blister. This pocket of fluid helps to protect the new skin when the harder, older skin is damaged. Left alone, the fluid will reabsorb on its own. There is no need to pop a blister. All popping a blister does is open your blister to possible infection. Many events can cause blisters including burns and illness. However, the common blisters seen on the feet of guests at Disney Parks are most often caused by friction (poorly fitting shoes), heat, and moisture. It is always better to prevent a medical issue at the parks than hoping that there will be a way to fix it once you have it. Gleaned from the wonderful Cast Members over the years below is my list of hints to help prevent blisters. Wear comfortable, well broken-in shoes that do not slip when you walk. One Cast Member reminded me that appropriate footwear is the most important thing you can do to prevent blisters (circa 1986—Grad Night when I was wearing new heals…). Flat soled, tie-up, sports shoes are ideal. But make sure you have worn them long enough to make sure they are comfortable. Leave the brand new shoes at home. Keep your feet dry. Bring extra socks for hot, muggy weather. Bring extra shoes if you are planning on the wet rides (Splash Mountain will soak you). I will bring flip-flops in my backpack and change into them before going on the water rides. Then I dry my feet and put my walking shoes back on after the ride. At the end of the day, wash your feet and dry them completely. Then use a powder to pull any extra moister from the skin while you sleep. Before you go, walk. One of the most obvious reasons for blisters is our office job. The skin of our feet is not hardened enough for the miles we walk at Disney Parks. Not only will the pre-visit walking help your feet prepare for the blisters, but it will increase your standing in line stamina. Bonus! If you have a section of your foot that feels warm, you notice friction or sliding on, or you know will be an issue, then take preventative action. Sit down, remove the shoe, and check the area. Add a preventative if you can (mole skin, band aid, blister-aid). Disney First Aid for blisters is antiseptic and Band-Aids. 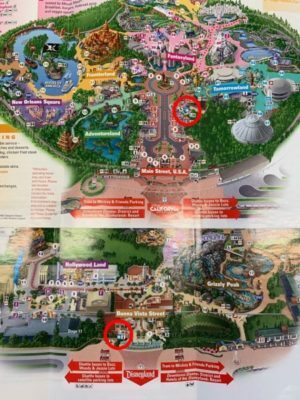 Each park, water park, resort, or Downtown Disney District in Disneyland or Disney Springs at Walt Disney World has its own first aid area. The Cast Members in the park and water park first aid stations are often registered nurses. They are knowledgeable not only in the treatment of your injury or ailment, but they are well versed in calming nervous or reactive casualties. These are the professionals to visit if your child (aged 1–99 years) is slightly hysterical. When you go into the First Aid Centers with blisters, the Cast Member will offer you everything you need to fix the exposed injury site. This will include a place to sit, antiseptic, and bandaids. Be prepared for the ‘how to prevent this in the future’ advice (see above). After all, prevention is the best cure—and it makes for a much more pleasurable visit to the parks. So, you tried prevention, but one of your family managed to acquire a blister anyway. 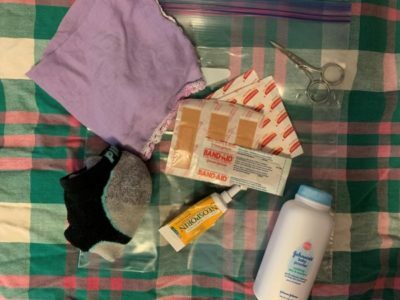 You have gone to the First Aid Center and the Cast Members have given you the products to help with the blisters and have shown you how to use them. Now it is up to you. First up, don’t pop that blister. As stated above, all this will do is open the blister to infection. Sometimes a blister will pop on its own. In this case, keep the blister and the area around it clean and dry. Disney Cast Members will advise you to clean and re-dress the broken blister twice a day. Cover the blister with a bandaid or soft dressing (there are blister covers for sale at drugstores and on site in some resorts). Change your shoes to a dry pair that doesn’t aggravate the blister, if possible. Bring dry socks to change if your feet get sweaty. Once home, visit the doctor if you see redness around the blister. If the blister site swells or there is puss or other signs of infection (for example, heat and pain), it is very important to see your doctor. I hope that you never have to deal with a blister at the Parks. But if you do, at least you know now that there is help on site. 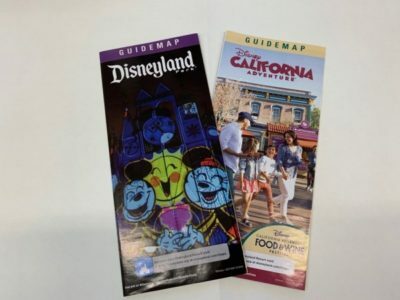 What tips do you have for dealing with blisters in the parks? Let us know in the comments below or on Facebook or Twitter!